After several years, Mascot Records is releasing a death metal album again. Although this label is normally closer to mainstream rock, I can understand their decision. While it is very difficult to distinguish one death metal band from another, Gory Blister from Italy really try to be innovative. Gory Blister started in the early 90s by releasing demo tapes and one self produced CD-EP. They received a lot of positive feedback and managed to be included on a Rock Hard Unerhört newcomer CD. 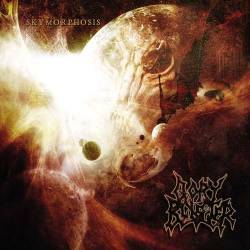 In 2003, they released their debut CD Art Bleeds on a small label before releasing its follow-up Skymorphosis on Mascot. This new albums starts with a short orchestral intro before delivering fast death metal played on an extremely high technical level. Gory Blister don't care about trends and don't imitate the Florida or Stockholm death metal schools. They combine their death metal with late 80s trash influences, and memories of Death, Coroner, Living Death and Kreator come into your mind. The fourteen songs on the record are rather compact, never give up their melodic components and the structures are often complicated as it had been the case for VoiVod. The vocals are screamed and rather high what suits well together with the melodic, but heavy riffs. There's not a single disappointing track on the album, but as highlights, I would choose the title track and I Shall Hang Myself. The record contains thirteen own songs and one Death cover version (1000 Eyes). If you like hyperblasting death'n'thrash metal, Gory Blister may be exactly what you have been looking for. It is always welcome to listen to a fresh sounding extreme metal band, something which has nowadays unfortunately become too rare.